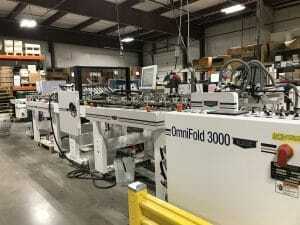 Millennium Press, Agawam, MA – Millennium Press announces it has increased its folder gluer capabilities with the addition of a Brandtjen & Kluge (Kluge) OmniFold 3000. As an appointed dealer for Brandtjen & Kluge, Pasquariello Graphics, Inc helped facilitate the sale. The OmniFold 3000 automatic folding and gluing system is a fully modular converting system designed to fulfill today’s need and grow with the future demands of the commercial printer and packaging manufacturer. Built to maximize converting capabilities while minimizing set-up time, the OmniFold includes features that bring productivity and reliability to a new level of expectation. These advancements are met with the quality you expect from Kluge. Jim Sullivan started Millennium Press in a one car garage in 1989 and today the company occupies a 20,000-square foot, state-of-the art building. “We used to do all our pocket folders by hand which would take one and half days to do 1000 folders. “explains Kelly Sullivan” Now we can offer better pricing because we can now run multiple folder jobs in a day.” This is a huge benefit to Millennium’s customers and the company. With an intense client focus, Millennium Press specializes in producing high quality, cost effective products for their clients. With services ranging from business cards, to catalogs and direct mail products, Millennium Press is a leader in the print world. For more information about the company visit www.millprinting.com. Adding value since 1919, Brandtjen and Kluge is a fourth-generation family owned manufacturer of specialty print finishing and converting equipment, including platen presses, folder gluers, uv coaters and blanking systems. For over 90 years the brand name “Kluge” has represented innovation, productivity and rugged durability to companies worldwide. Headquartered in St. Croix Falls, Wisconsin, USA, Brandtjen and Kluge has a fully integrated manufacturing facility and markets equipment through a direct sales force in the United States, Mexico, Canada and has a well-established network of industry-qualified distributors to provide global coverage. For more information, visit www.kluge.biz. Since 1995, Pasquariello Graphics is dedicated to providing their customers with the best solutions to fit their individual on-going needs. Whether the solution is machinery, training, or prompt and thorough on-site service, Pasquariello Graphics quickly and courteously solves the problem. PGI is located in North Attleboro, MA in a 14,000 square foot facility consisting of offices, warehousing and a rebuild center. The company has grown to be the largest rebuilder of MBO equipment in the United States. For more information, visit www.pasqgraphics.com.